HAMILTON, Bermuda (AP) —Police officials in Bermuda are confirming that they have found the body of missing U.S. student Mark Dombroski. Acting Assistant Commissioner James Howard of the Bermuda Police Services declined to provide certain details, include how authorities believe he may have died during a visit to the British Island territory. The discovery of his body was announced at a news conference in the British island territory after a day of searching that involved members of the 19-year-old's family, volunteers and local authorities. (AP) - An American college student has been reported missing in Bermuda. 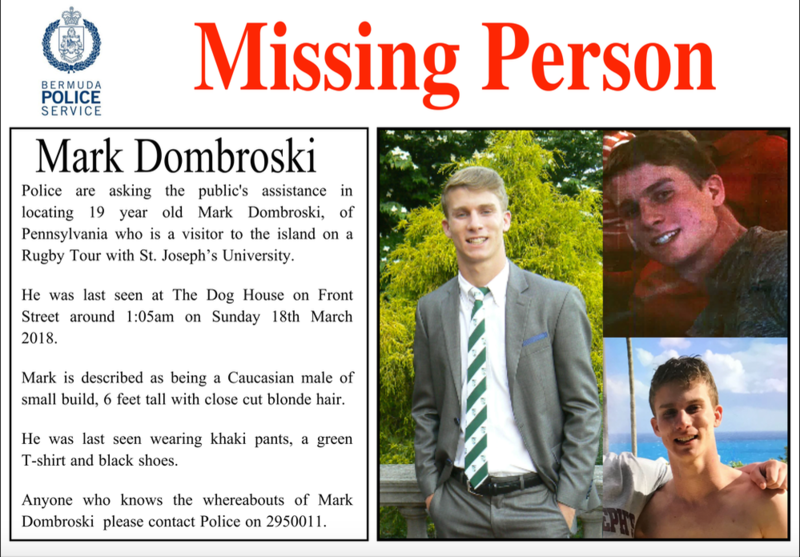 Bermuda police say 19-year-old Mark Dombroski was on a rugby tour with Saint Joseph's University, of Philadelphia, when he disappeared early Sunday. Police say he was last seen around 1 a.m. at The Dog House, a bar and restaurant in Hamilton, the island's capital. They are asking for the public's help in locating the missing teen, circulating a flyer with his photos. The police say "there is concern for his well-being." Saint Joseph's is a Roman Catholic Jesuit university. It issued a statement saying it has been in touch with the freshman's family and "continues to pray for his safe return." A Saint Joseph’s University rugby player has gone missing during a team trip to the island of Bermuda.